From decks and porches to patios and sunrooms, outdoor living spaces are not one size fits all. What functions and works well for one homeowner may not be perfect for another. When I initially saw this project from our patio and deck builder in Chicagoland, I thought the before picture was a pretty nice space. 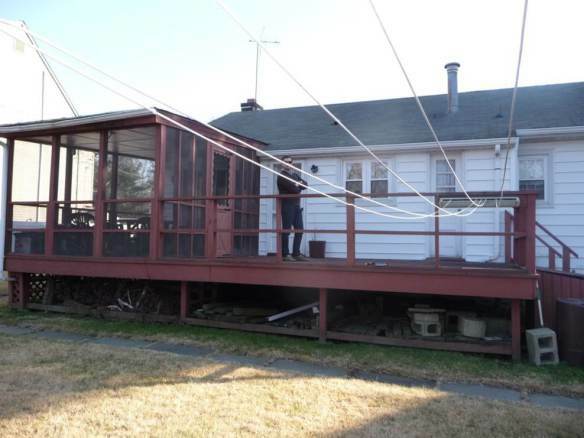 Seen in the picture to the right, the deck was large spanning across the width of the house, but it didn’t work for the homeowners. It wasn’t their taste and didn’t function as well as they believed it could. 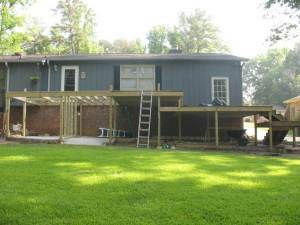 The homeowners wanted to replace the existing deck with a patio. For how they envisioned the space working, they felt that a patio would work and look better than a deck. Luckily they worked with Kristen Berryhill of Archadeck of Chicagoland to design their new space and the end result was just what they were looking for. The owners of this home enjoy entertaining and wanted space for cooking, dining and relaxing. Kristen created a unique patio design with multiple layers, materials and shapes give the clients exactly what they wanted. The top level of the patio is where the family does their cooking. The grill is here and it has easy access to the kitchen doors. Access to the indoors is an important piece of outdoor design; it has to flow. Having the grill, for instance, on the opposite side of the space than the kitchen door would make it more cumbersome to use. My favorite area of the space is down two steps from the grill, where there is a bar area with outdoor stools. It’s the perfect place to eat or just sit and have a drink with friends and family. The curved space makes it special and it overlooks their beautiful property. You can see how the curved perimeter is mirrored on the materials on the base of the patio. A darker paver was used set this particular area apart from the rest of the space. Beyond the bar area is an open space that can be used for just about anything. Right now the homeowners are using it as an additional place for dining outdoors. In this area, you can really see why the homeowners wanted a patio instead of a deck. 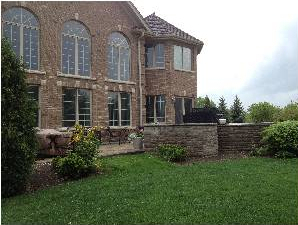 By keeping the space level with the ground no railings were needed and it opens up seamlessly to the beautiful yard! And if you take a step back and look at the project as a whole, you really can see that this space is a step up from the previous deck. It complements the home’s finishes instead of looking like an afterthought. It’s a wonderful space and wonderful patio design from Archadeck of Chicagoland! If you have questions on enhancing your outdoor living space to work better for you, please contact your local Archadeck office. One of our trained designers and builders can surely help! When we meet with a new client, we ask them what their dream backyard includes. Do they eventually want a space that has a deck, outdoor kitchen, pergola and more? We want all our outdoor projects look cohesive and not an afterthought. A complete design plan is key to that. 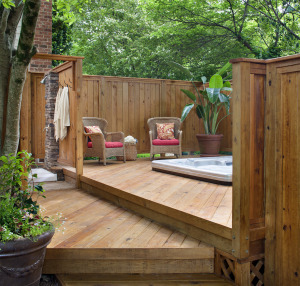 Not every client can build his or her dream backyard at one time, instead it may take years. At Archadeck Outdoor Living, we believe that thinking ahead is the best way to make sure that the end project is indeed the outdoor living space the client has always wanted. Through the design, we can decide what pieces can and should be built when if it can’t be done all at one. We call this staged building. This project from our patio and deck builder in Charlotte is a good example of a space that has everything the owners could ever want and could have been built in stages. This picture shows the view from a nice screened porch off the back of the house. It looked out of over a large patio and pool. The portion of the patio around the pool and the screened porch would have been a good first step in creating this backyard space. They are the anchors of the final project of this backyard. Everything else could be added on from there. 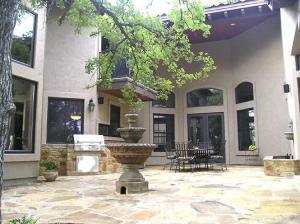 Off the pool patio, there is another hardscaped area, mostly a large covered patio. 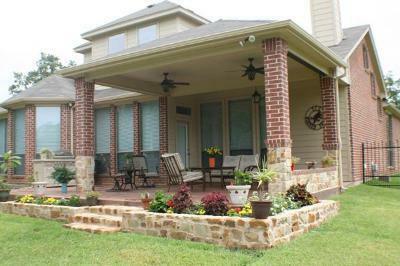 The covered patio is really an outdoor room for the family. It is centered around cooking and dining. I love that enough space was allocated for both a good-sized outdoor kitchen and a dining area. It doesn’t make sense for them to be separated from one another. An open patio area is set to the size of the covered patio that has space for chairs around a beautiful fire pit. This would make a good portion of the project that could be done in the second phase of building. 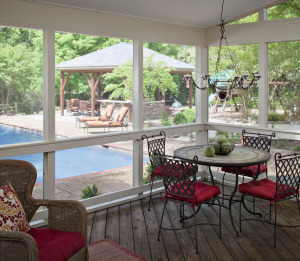 Lastly, to the right of the screened porch, there is a private deck area that is used for an outdoor shower and hot tub. The high fence that surrounds it acts as a privacy wall around the space. It is set up as a more private “oasis” within this gorgeous backyard space. This could have been done in the last phase of the build. A good backyard design keeps the present, future and the dream in mind. The homeowner then has an idea of what can be and can work towards making it happen. If you have questions on how to create a design based on building in stages, please reach out to your local Archadeck office. It’s been a few weeks and it is time for an update on our Archadeck Dream Backyard Contest winners! Last we checked in with Rick and Merea Bentrott they had finalized their deck and patio design and were ready to start building. Harold Cross and the rest of the Archadeck of Central Iowa have been hard at work on the space! 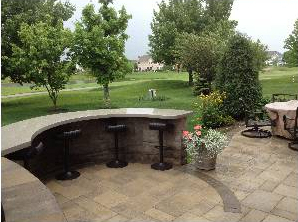 The Bentrotts decided to enhance the patio portion of the space and add a fire pit and a seating wall. Extending the patio provides for more entertaining space and the kids (they have four) are sure to enjoy roasting some s’mores around the fire pit. Much like the benches on the deck, we are providing built in seating on the Belgard patio. 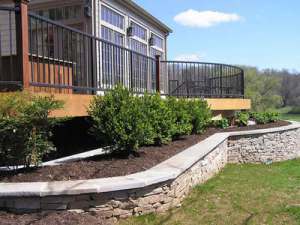 Retaining walls, when built with the correct height in mind, not only provide the perfect place to sit, but also another way to define the space and create the flow. With the design plan in place, Harold and his team were set to break ground and start constructing the Bentrotts’ Dream Backyard. Videos of the build throughout the process can be seen on Archadeck of Central Iowa’s YouTube channel. After six days of finished work, a lot of construction has been done. Demolishing the existing deck and leveling the area for the structure were the first tasks. On day two on site, a lot of dirt needed to be dug out for both the base of the patio and all of footings on the space. The footings are essential to the safety of the structure and were needed for the deck and covered porch. Unfortunately, there are some things we cannot control, like the weather. A few days of rain delayed us, but we are back on track! The deck framing is finished and the boards have been installs. The decking was provided by our contest sponsor, TimberTech. The color of the boards is Brownstone and they were laid in a diagonal patterns instead of the classic straight version. The frame and roof of the covered patio have been installed. Underneath and beside the covered area is the patio itself which will be done using Belgard Pavers. What goes beneath the pavers, called base, is incredibly important with respect to the integrity of the structure. Without a good base, the homeowner may notice some uneven areas over time. A base layer of rock has been spread over any area where pavers will ultimately be. We can’t wait to see the final product and how the Bentrotts will enjoy their new backyard space. In the meantime, if you have questions concerning any outdoor structure, please contact your local Archadeck office. Last week, we showed you the finished patio for the second place winner of Archadeck’s Dream Backyard Makeover contest. We received some requests for an update on the Grand Prize Winners’ home and who are we to disappoint?! 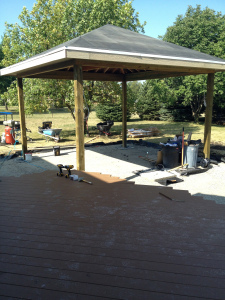 Since then, Harold Cross of Archadeck of Central Iowa has been working with the Bentrotts to finalize a patio and deck design that will fit their needs. We are thrilled to announce that the design is now complete, and we should be breaking ground in the next few weeks! But, let’s talk about the design! The Grand Prize Winners will receive a $70,000 backyard makeover that will include both a deck and patio component, with products from our partnering sponsors, TimberTech Decking and Belgard Hardscapes. Merea and Rick really wanted a place to entertain family and friends so Harold came up with a combination project that includes a deck, covered patio and outdoor kitchen. Doesn’t it look like a nice place to enjoy time outdoors? Despite the condition of their current deck, the Bentrotts did like having a deck off their main living area and wanted to keep that in the design. Railings will be installed around most of the deck not only for safety (which is very important with four young kids), but also to guide visitors into the lower covered patio portion of the project. 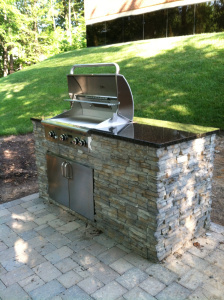 The patio has plenty of space for Merea and Rick to prepare meals with their new outdoor kitchen! Harold decided to cover the majority of the patio not only to define the space, but also to provide some shade and coverage from the sun, rain, and in Iowa, snow. We are thrilled to start the building phase of the project. We will share images throughout the build through their first party on their new space! If you have any questions about outdoor living structures, please reach out to your local Archadeck office. It’s been a while since we updated everyone on our Dream Backyard Makeover Contest. Some of the projects are in final design and build, but one second place winner is now the proud owner of a brand new Belgard patio, designed and built by Archadeck of Chicagoland. This is what the Hall family had to begin with. Underneath the snow there was a small concrete patio that wasn’t the beautiful space they envisioned relaxing on. The family explained in their contest description that they bought this house only days after the birth of their first child. While they love the home, they really wanted a space to entertain friends and family outdoors. The Halls were second place winners in the Archadeck Dream Backyard Makeover, which means they won a $7,000 patio project with material from Belgard Hardscapes. David Berryhill of Archadeck of Chicagoland worked with the family to design a space that fit the space and worked for their needs. The patio design, as seen in the picture below, was set off of their main family room. Existing walkways both from the other back door and the front yard, were left to work as additional entry points. The property is on a corner lot which lacks privacy. While the Halls wanted a space that was open, a retaining wall was added to the design for a little privacy and to clearly define that side of the space (not to mention retaining walls make great seating!). One of the most noticeable aspects of the design is its shape. 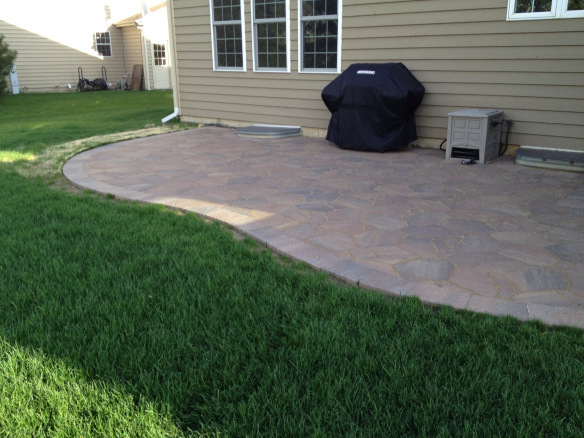 David created a curved patio instead of the more common square or rectangular patio. Sometimes straight lines can make furnishing the space more difficult (unless the space is very large). Curved lines allow for more creativity. The actual build of the space took about a week. Demo was the first step. There was a concrete slab off the back of the house to begin with that needed to be ripped out. While the team was chopping up and removing concrete, they also dug the space needed for the patio base and added drain tiles to make sure water doesn’t pool on the surface. The patio was done in Belgard’s Holland Stone pavers and placed in a random pattern. Below the pavers are inches of base to anchor the space and keep it level and in place. 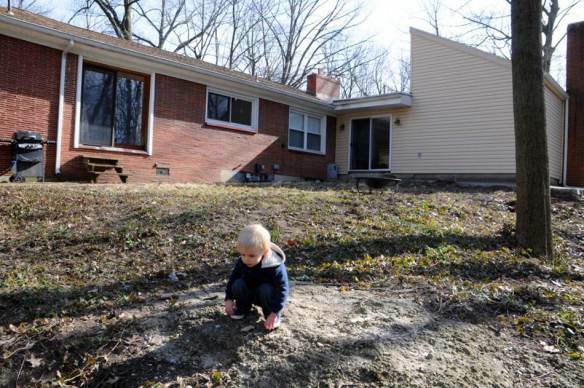 There are 4 to 6 inches of crushed limestone covered with just under an inch of sand. The sand allows the patio builders to lay the pavers in place and keep them sturdy. Doesn’t the space look great? We think that David did a great job! The Halls are now enjoying their new space, which we are thrilled about. If you have any questions regarding paver patios or other outdoor living spaces, please contact your local Archadeck Outdoor Living office. It’s been a long time since we updated you on the outdoor living structure that we designed and are building for our corporate office and we are happy to say that it is 99% finished. The remaining items on the list are primarily clean up. So what’s been going on since we last updated you? In short, a lot. It is quite the difference, right? In our last post about the project, we had just finished framing the deck and started laying the deck boards. As you can see, that and more has been completed. 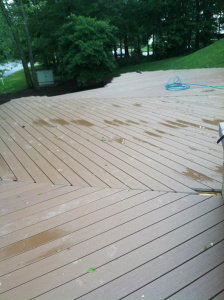 The majority of the deck is a dark brown TimberTech composite material. It was installed at an angle for added visual interest with highlight boards that are a brick red color (I apologize for the shadows in the pictures). The composite material will minimize our need for regular maintenance. Pressure-treated wood, as opposed to composite, needs to be pressure washed and stained to ensure that water, dirt and other debris don’t settle in the wood cracks and cause splitting. As you can see in the picture, the built-in benches have been added to the space. One of our goals in creating this outdoor living space at the office was to have a space that everyone in building would really use (not just look at). Seating is extremely important for regular use and with a commercial space that does get some traffic, the seating couldn’t be movable. While the retaining walls offer some seating, benches were added throughout the space to invite people to relax and take a seat. With such a large amount of dark decking, our deck designers decided to complement the structure with white highlights in the form of railings and the pergola. 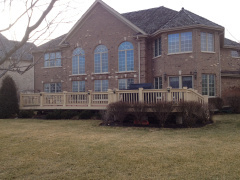 Timbertech vinyl railing was installed around the open edges of the deck for safety purposes. 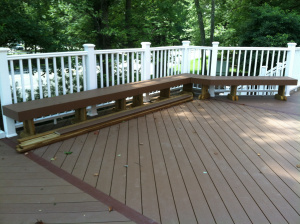 Any deck that isn’t low to grade, meaning that it rises at least 36 inches off the ground, must have a railing by code. Once the railing was up, everyone here started to see the whole the project come together. The crisp white makes it really pop. When the Archadeck Outdoor Living team discussed what they wanted in the space, a shade structure was a key component. The pergola was added to the design and covers nearly half of the 900 square foot deck. In a space that gets a lot of sunlight, the pergola offers a reprieve. While the building part of the space is pretty much finished, there are a few finishing details that are still to come. Outdoor lighting is going to be installed for safety and security (as well as beauty). Besides that, we just need to get rid of any construction debris and we are ready to host our first barbecue at the office. 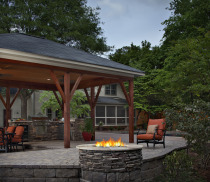 If you have questions on how you can enhance your backyard with a custom outdoor living space, please reach out to your local Archadeck office. Our trained designers will work with you to create something that works for you, your family, your needs and your budget. One of my pet peeves is wasted space. When my husband and I were looking at new homes, it was something that always jumped out at me. Getting the most out of a space is important to me; it has to have purpose. And that goes for outdoor living spaces as well. A lot of our Archadeck clients use their outdoor living spaces for multiple purposes which makes the patio or deck design all the more important. The flow of traffic and areas for different purposes have to be considered so that the homeowner gets exactly what they want, without wasted space! This recent project from our deck builder in Boston really stood out to me because it is multi-purpose and laid out beautifully. The homeowners wanted an outdoor living structure that could be used a lot of ways, but they didn’t want it to feel completely disjointed. They love to be outside and wanted areas for sitting and relaxing, dining, a place for their hot tub, a shaded area and a fire pit for the cooler fall nights. Jim Finlay from Archadeck of Suburban Boston was put to task to create a space that could fit all of these needs, and personally, I’d be thrilled to have a space like this. Because the main level of the house is two stories up in the back, it was clear that an elevated deck would be a large component of the space. The deck is used for seating and for dining. Having the dining area on the deck was a logical decision due to its proximity to the kitchen. To define the space, Jim designed a portion of the deck that is multi-sided and the decking boards were installed in a different direction. 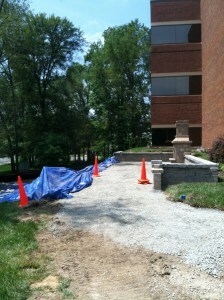 Small stone columns were added to the entryway of the space adding more definition. The deck also acts as a sitting area. This section has a three-sided built in bench that provides adequate seating for multiple guests. As you can see in the picture, additional seating was placed around the bench to make it even more conducive to conversation. Off the side of a deck is a staircase leading down to the other parts of the space. Because the hot tub is the only space they would like a little more seclusion (without being completely cut off from the deck and patio) that space was kept to the right of the stairs. To the left is a large partially-covered patio. The patio was a perfect spot for both the fire pit and shade. Classic pavers were used for the patio. The fire pit section jets out past the deck and into the yard so that people on the deck can still see and speak with visitors below. One of my favorite details is the stone surrounding and defining the fire pit. They match the stone on the columns on the deck and underneath the porch. Since the deck had to be elevated, it became the perfect place to escape the sun. Under decking was added to ensure that the space stays dry even when it is raining. 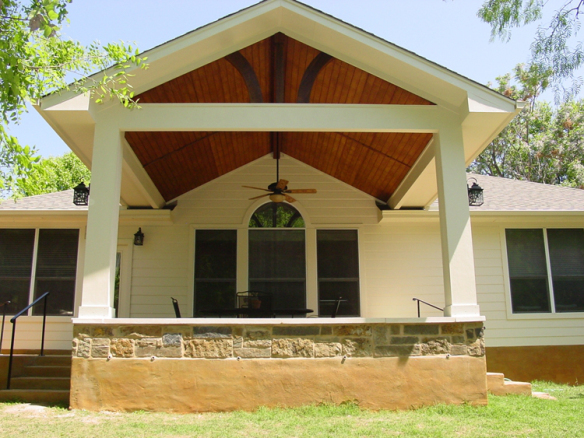 The homeowners installed a television on the porch beams for nighttime entertainment outdoors. Talk about relaxing! 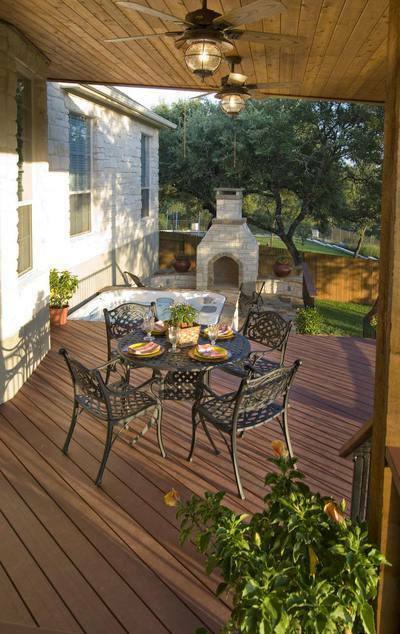 This patio and deck design fulfills all of the homeowners needs and is stunning. If you are looking to have a space designed for your yard, make sure you consider how you are using the space and even what furniture may be placed. If it doesn’t flow well, ask for changes. As always, your local Archadeck office is there to help you will all your outdoor living questions. It’s been a few weeks since we updated you on the progress of our deck and patio installation at the Archadeck Outdoor Living headquarters, and there has been a lot done! We have a fully installed and functional outdoor kitchen and the large deck is in progress. 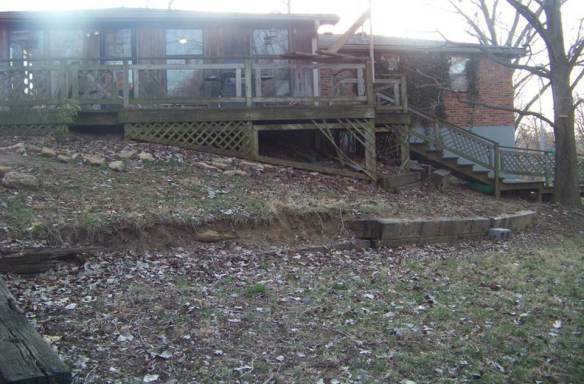 We didn’t show you in the last picture, but there is a smaller patio that is set down beyond the deck. 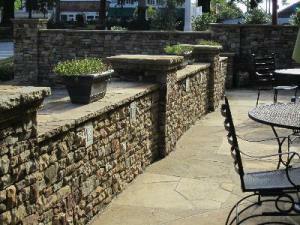 It was installed at the same time as the rest of the Belgard paver patio and retaining walls. We designed the space with this extra patio for our outdoor kitchen as it could be a little removed from everything else. Our team of designers kept the layout of the kitchen simple, with a large grill (yes, we already broke it in) and some counter and storage space. The kitchen was finished with a natural stone to complement the Belgard patio pavers, but we chose a dark black countertop to dress it up a bit. Once the patio and outdoor kitchen were complete, the Archadeck team of deck builders was hard at work on this 900 square foot composite deck. The footings were dug prior to the patio going down, but the deck frame took a few days to complete before the county inspected it. The frame was built using a pressure treated wood and you can see that each beam and joist were securely put in place with large bolts as no deck can be safely built with only nails (that’s a deck collapse waiting to happen). After the county inspector came on site and passed the deck frame, we began laying our deck boards. 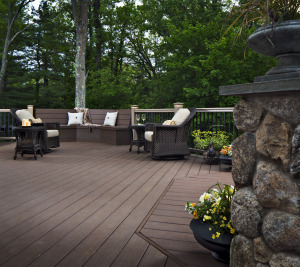 For the decking material, we chose a TimberTech composite from their Evolution line. As we hope to get a lot of use out of the deck, including hosting corporate events, we needed something that would stand up against scratches and wear and tear, which TimberTech does. You notice in the picture of the decking going down that you don’t see a lot of nails, and that’s because there aren’t any. These decking boards have hidden fasteners that lock everything in place without the need for nails, which helps create a clean look. While building the deck, we also constructed the stairs leading down to the outdoor kitchen and small patio. 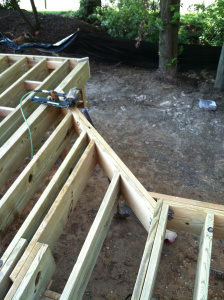 The framing of the stairs were inspected at the same time as the deck and the decking began shortly after. Unfortunately, as with many outdoor builds, Mother Nature hasn’t been too cooperative and has put us a little bit behind. The team is finishing the decking and then will begin on the railings. The railings will be white vinyl from TimberTech that will border the entire deck for safety and code purposes. 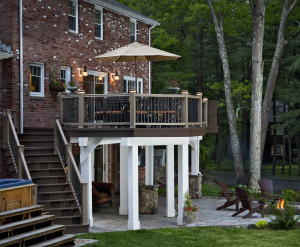 If you have questions about designing custom decks, porches, patios, sunrooms or some combination thereof, please contact your local Archadeck Outdoor Living office. In this next installment chronicling the new deck and patio combination project at the Archadeck headquarters, I’m happy to announce that we can check the hardscape installation off as complete! 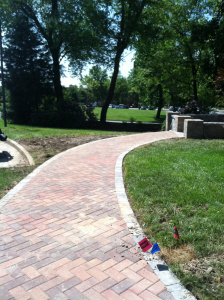 Our beautiful walkway, large patio, fireplace and retaining walls were finished yesterday and it looks great! Prepping the ground to lay pavers is a time-consuming process. As we’ve covered in previous posts, the ground first had to be leveled out so that the entire space is even. Once the ground was leveled and the footings for the retaining wall were complete, a layer of base stone is packed on the ground and then a layer of sand. Grading, base stone and sand ensures that the paver patio is level and will stay that way. In our case, the majority of our pavers are from Belgard Hardscapes’ Dublin Cobble line. The pavers are very classic but have subtle variations of color that add visual interest. Because the building itself is brick, as is our main entrance walkway, we needed to incorporate another paver design so that nothing looked like an afterthought. Had we done the smaller walkway in Dublin Cobble, it wouldn’t have flowed as nicely. Instead we used a classic brick look lined with the Dublin Cobble. It really marries the two areas and finishes nicely. Once all the pavers are set in place, polymeric sand is brush across its surface, filing the cracks between each paver. Polymeric sand is the best way to lock the patio in place. The sand, while dry, is just like any other sand, working its way into all the small spaces between pavers, but when it gets wet, it hardens and locks in place like cement. Without the sand, the pavers could become loose. While prepare to lay patio pavers can be time consuming, laying them down doesn’t take too long, unlike building retaining walls. I am lucky enough to have a window that I can see the process and progress on our patio and deck installation. It was very interesting to watch the installation of the retaining walls as opposed to the patio. The team carefully checked the level frequently while building, making sure everything was even throughout. Those repeated checks definitely made it take longer, but it is an important step that shouldn’t be overlooked if you want a sturdy and secure retaining wall. The next step in the build process is the deck. Our team of deck builders will be on site tomorrow to get started. The large deck will be built with TimberTech decking and will abut the patio and retaining walls (the walls will also act as built-in seating for the space). The deck footings were dug at the same time as the patio footings so that we could have them all inspected at once. Just to recap, here is what we started with…. It has been really fun for our entire team at Archadeck Outdoor Living to watch the entire design and build process. We’ll keep you posted on the next step! A couples weeks ago, we announced Rick and Merea Bentrott as the Grand Prize Winners of our Dream Backyard Makeover Contest, but they weren’t the only winners! When evaluating the Facebook and panelist votes, second place was a very difficult decision, so we settled on two second place winners! One will receive a patio renovation with Belgard pavers and one will receive a deck renovation# with TimberTech decking. 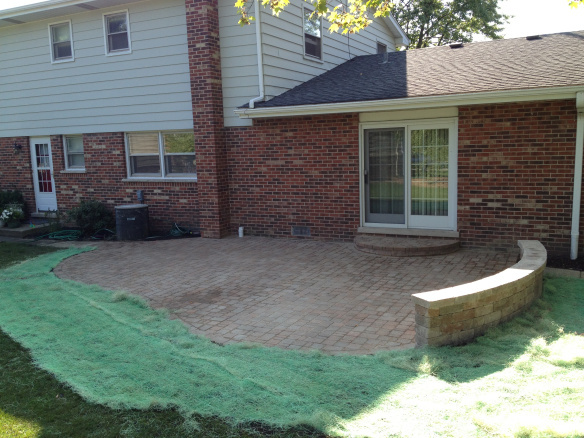 We are excited to help the Halls enhance their backyard with the design and installation of a Belgard patio. David Berryhill of Archadeck of Chicagoland will work with the family to design a patio that fits their needs and tastes. As always, I’ll be updating you on the progress of the project. The Carlls will be receiving a new TimberTech deck designed and built by Archadeck of West Central Ohio. Tim Stephens and his team are sure to take good care of this family. And hopefully that little boy of theirs will have a beautiful and safe place to play! Our third place winner, William Jakes, lives in the Columbia, SC area. He and his family will be receiving an outdoor lighting system from our sister company, Outdoor Lighting Perspectives. Outdoor Lighting Perspectives designs, installs and maintains custom outdoor lighting systems for residential and commercial properties. They even do holiday lighting! I hope to share all the details of all the projects as they go on. Congrats again to our winners. We Have an Outdoor Fireplace! It’s week two of our patio and deck build here at the Archadeck Outdoor Living corporate office and a lot of work has been done. The once grassy patch to the left of our building is now a construction site with bulldozers, dirt, sand and holes! Over the last week the construction crew has been hard at work leveling the space and digging the footings for the deck and outdoor fireplace. 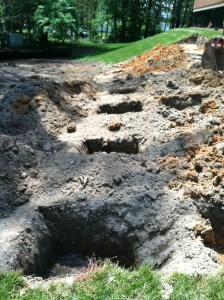 We mentioned footings last week, but here’s a picture if you can’t quite picture it. Footings, as you can see, are just holes at this point in the build (they have since been filled with concrete since I took this picture). The largest footing was dug for our outdoor fireplace. The fireplace itself is very heavy, so the ground beneath it has to be supported by the footing (imagine an extra-large hole). 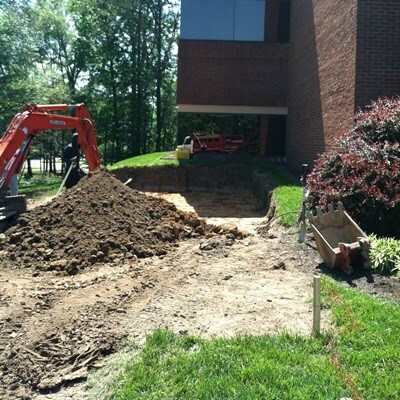 Once the footings were inspected by the county, we were able to start building our retaining wall around the space. Concrete was mixed on site to place in between each and every paver. Without that, people would run off with them they look so good! The retaining wall is serving a few purposes for us. First off, it is used to define the edges of the patio space. The patio is low to grade which means that it doesn’t by code need a railing, however we had to dig into a hill to clear the space for the project. If we didn’t have the retaining wall, everyone would be enjoying the sight of a wall made of dirt. I prefer the pavers. The second purpose it serves is as a place to sit. We are going to have built in benches and retaining walls around the space to make sure everyone can sit when wanted. 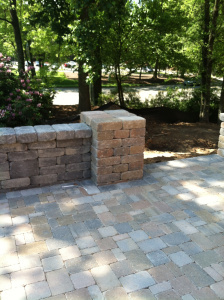 Once everything was all set, we were able to move the Belgard outdoor fireplace into its position. 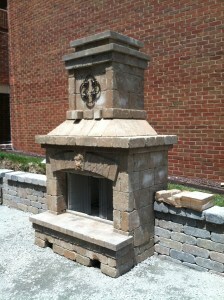 Outdoor Fireplaces come in a variety of shapes and styles. Many are gas burning, but we chose to use a wood burning one. Isn’t it pretty? My favorite part is the iron accent on the chimney section. It’s small details like that that give that warm/homey feeling. Overall it’s a very classic look. We are all anxious to use the space. Just a few more weeks and I’ll be sitting outside writing this blog! If you are interested in learning more about outdoor fireplaces and fire pits, please reach out to your local Archadeck Outdoor Living office. I’m confident we could find something that would look great in your yard! We’ve been waiting for this day since February 1st! Back in February we launched Archadeck’s first Dream Backyard Makeover Contest. For nearly three months we received photo submissions along with descriptions of backyards across the country. From over 2,000 submissions, we narrowed the field down to 6 finalists and opened up Facebook voting then the decision fell in our panelists’ hands. They had an extremely difficult time choosing the Grand Prize Winner, but ultimately the decision was made! As parents of four kids under ten who, essentially, live outside the majority of the year, we’re in dire need of backyard help! Recently, we adopted two incredible kids from foster care and instantly became a family of six. The addition of these little ones enriched our lives, but shrunk our home! Hence, the move to a larger house with good bones and smarter space but also a need for serious updating. Since the move, we’ve slowly been saving money and fixing up the interior. Unfortunately, the backyard has received little attention as it’s been placed at the end of our long list of to-dos. Despite constant competition from technology, my continual goal as a parent is to keep my kids outside playing, imagining, and dreaming. Currently, we rely on a homemade sandbox, trampoline, a rickety, hand-me-down play-set, and deteriorating, wooden deck. My backyard dream is to give my kids a safe, fun place to play and my husband a space to relax with a beer in one hand and grill tongs in the other, standing next to a Green Egg Grill. All I really want for myself is a comfortable spot to sit and watch it all happen. I was lucky enough to speak briefly with Rick and Merea on Friday and needless to say they were beyond happy and surprised to be chosen our Grand Prize Winners (they are as sweet as can be too!). After visiting the property, we could tell that it isn’t the safest spot to occupy four young active children. 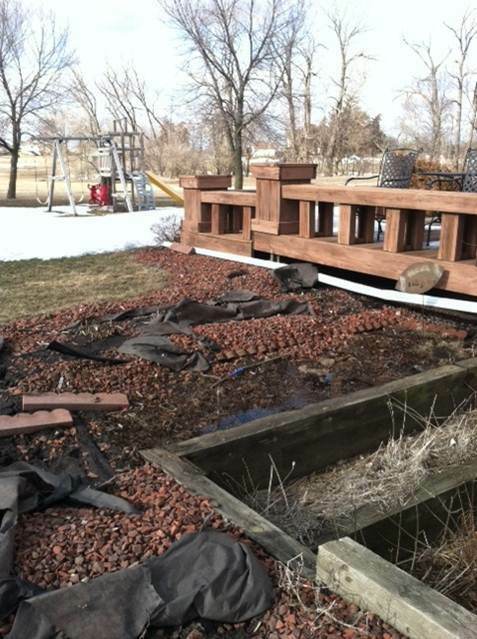 The existing deck is deteriorating and splintering which is a cause for concern. Additionally, there are wooden beams on the property that are rotting away. On Friday’s visit, Rick, Merea and Harold discussed their dream backyard project. The outdoor living structure will include both a deck and patio component with products from Archadeck suppliers TimberTech and Belgard. We know that we’ll be able to provide the safe and beautiful space that they desire and we’ll be sharing each step with you. Next up is the design phase. Armed with the Bentrotts’ needs, wants and tastes, Harold is creating a 3D rendering of the space. More information to come on the 2nd and 3rd place winners. 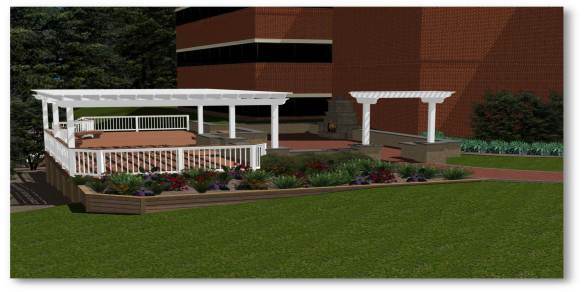 Several weeks ago, we announced that we at Archadeck Outdoor Living’s corporate office are getting a new outdoor living area. We are thrilled to let you know that after some weather delays, we officially broke ground today! To recap, up until now, our corporate office has been of void of any outdoor living structures (we know, it’s sad considering what we do). This year, we decided to change that and designed this custom deck and patio combination project. A large pergola will cover part of deck for shade and built in benches and retaining walls will provide places to sit throughout the space. Last week all of the patio material was delivered and trust me, it is a lot of pavers. Included in the material is the outdoor fireplace that will be installed on the project. In preparation for the first phase of building, we had to file for building permits. After the county reviewed our plans and specifications, we were able to grid out the deck and patio on the property. Victor, our Director of Construction and Drafting who is spearheading the build for us, went outside with members of his team and sprayed a pink paint to illustrate where the building will take place. This allows the sub-contractors to envision the space and know exactly where to build. With the paint and permits in place, we were ready to build! Of course, Mother Nature had other plans for us. After a few days of rain, the ground needed to dry out a bit before we started digging. And finally today we were ready! The first phase of the build is the patio and footings for the deck. This morning, bright and early, bulldozers started digging into our lawn to grade the area. Grading is the process of leveling out the ground. For us, the land that we are building the patio is uneven, sloping down to the road. The bulldozer cuts out the grass and dirt to level the area so that when the patio is built is it sturdy and level. It has been pretty interesting to see the difference in just a day, these guys are fast! Grading is also key for the drainage of the patio. Uneven surfaces hold water and puddle instead of properly draining and may cause future problems. The footings for the structure will also be dug this week. Footings are the load bearing parts of an outdoor living structure. Before we start building the deck portion of the project, a county inspector will come out and test the ground and evaluate our footings. When they are all given the green light, we will be ready for to start the deck! Everyone here is more than excited for an outdoor space at the office. On a beautiful day like today, it would be wonderful to have a nice spot to sit and hold a quick meeting while enjoying the sunshine. Our goal in designing the space was to create a combination project that not only features some our most commonly built structures, but also to create a space that is usable. 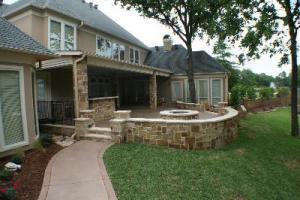 By including the outdoor fireplace and outdoor kitchen, we are ensuring that it is used. 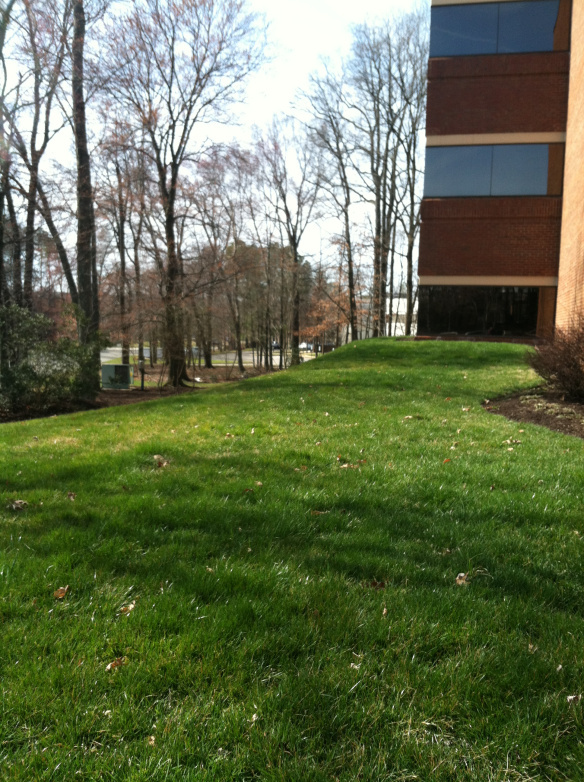 The other offices that are part of the building are just as excited to have a space to enjoy the outdoors as well! The time has come! Voting is now available for the Archadeck Dream Backyard Makeover Contest. Out of over 2,000 photo entries, we’ve narrowed the field down to six and here’s where you come in. Logon to the Archadeck Facebook voting page to vote for your favorite finalists! Public votes will help us decide who the final winner will be. I can’t wait to announce the grand prize winner in mid-May! After the winner is revealed, we’ll be keeping everyone abreast of each step of the process, from deck and patio design through construction and the final project. I’m particularly excited to learn more about how the winner envisions using the space and how we can make that a reality through our custom outdoor living design! We hired a contractor to rebuild our deck and he did about half the work and abandoned to work sight. After inspection, we found out that nothing was to code and he did not have a contractors license. This was part of our retirement savings and now we will have to wait until we can save up the money to have the deck torn down and rebuilt. My husband and I are brand new homeowners and first time parents to a son…all within the same year. Both my husband and myself never had a private backyard to play in when we grew up (he grew up in the Bronx and I grew up in Queens, NY). So when we saw this house in Greenwich, CT with a private backyard overlooking a pretty pond we overlooked the ugly red, 1968, totally not up to code, beat up porch and thought this could be a great place to raise a family. We had to do a gut renovation of our house but didn’t have the funds to do any work on our backyard. This will be our first summer where our son can really enjoy the outdoors so we would love the opportunity to give him a space that is safe and enjoyable for friends and family BBQs. The photo is of my husband on our porch when we got the keys to our very first home. We are of family of 8 with 6 kids ranging in age from 2 up to 11. That doesn’t include numerous neighborhood kids that all love to come over and play at our house. They all enjoy the outdoors and we would like to make our backyard a safe and fun place for them all to play as well as a beautiful spot for my husband and I to relax and enjoy. 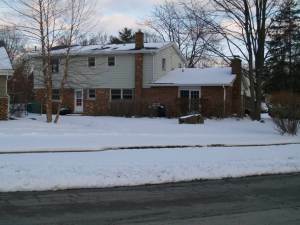 Our home is situated on a hill and the backyard is terraced. 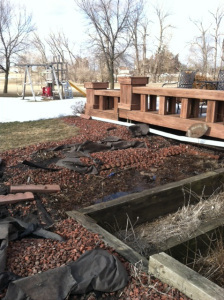 The retaining walls, made with railroad ties, are rotting away and our deck is falling apart. We would love to have a sturdy deck that we could sit on in the evenings, grilling out, and serving up a bunch of fun to all the kids. My family and I are fortunate to live in a wonderful neighborhood surrounded by beautiful trees and great neighbors, but our fixer-upper leaves much to be desired. We recently purchased this home with stars in our eyes, creativity in our hearts, and a shoestring budget. The first words that came out of my husband’s mouth when we were viewing the back yard with our realtor were: “someday this will be the most amazing spot for a deck…” Our dream is magnificent, but our reality is daunting. The current state of our backyard makes me cringe every day when I open the curtains, or chase down my toddler and tell him “No, no – you can’t go back there”. Our dream deck would replace vines, a pile of concrete, construction debris, and other unsightly features that make the space unusable. We envision a tiered outdoor living space where we can grill, unwind, entertain, get to know our neighbors, let our toddler play, and enjoy the natural beauty of our neighborhood. 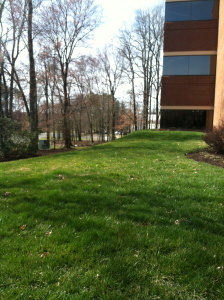 We have a blank canvas on an amazing lot that is full of possibilities. We just need help to turn our dreams for this space into reality! 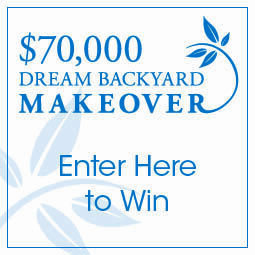 Four Days Left to Enter Dream Backyard Makeover! Over the past two and half months, we at Archadeck Outdoor Living have been thrilled to be running the Dream Backyard Makeover Contest. Unfortunately, there are only 4 more days to enter! If you haven’t submitted a photo of your current backyard along with a description of what you would like in your dream backyard, make sure you do it by April 22nd, 2013! Voting on the six finalists will be begin on Wednesday, April 23rd and the contest winner will be announced on or around May 6th. As of this morning, there have been just under 1,700 submissions. It’s been wonder reading all of the entrants’ stories and learning more about how they intend to use the space (some of you have great plans!). The grand prize is obviously the $70,000 backyard makeover which will include both a deck and patio component using TimberTech and Belgard products. Recently, I’ve been receiving questions on how the deck design will be settled on and built, so I wanted to describe the process the winner will be experiencing. Our deck designers and builders take their job very seriously. It is our goal to provide you with a space that is not only beautiful, but also usable and the homeowner is key to that conversation. After the winner is chosen, our local Archadeck owner will visit with the homeowner, survey the entire yard and discuss the needs and wants of the family. By knowing the intended use of the space as well as some of the homeowners likes and dislikes, a custom outdoor living environment can be created that will make everyone happy. 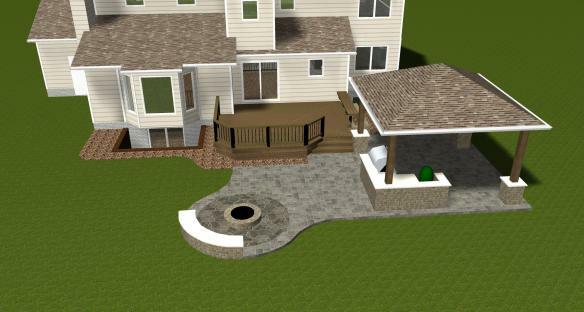 Just like the typical Archadeck Outdoor Living client, the Dream Backyard Makeover Contest winner will be given a 3D design rendering of the space so they can easily envision the end outcome and what it will look like in their backyard. I must say, it can be incredible to see the before, the design and the after. Once the design is settled on, Archadeck will pull all the necessary permits and get all the necessary building materials ready to get started. And, from there, the transformation begins! Our franchisee and their local team will work to get the space built so that the homeowners can once again enjoy their backyards. Everyone at Archadeck can’t wait to get started on the contest winner’s backyard. Only a few weeks until the winner is finalized! As always, we’ll be here updating you on the project along the way. Again, if you haven’t yet submitted your entry yet, you have four more days to do so! You can enter at DreamBackyardMakeover.com. It has been a busy month for Archadeck and its Dream Backyard Makeover Contest. We are thrilled that so many people have taken an interest in the contest. With over 1,000 entries, it was extremely difficult to pick two for the month of March, but somehow we did it. 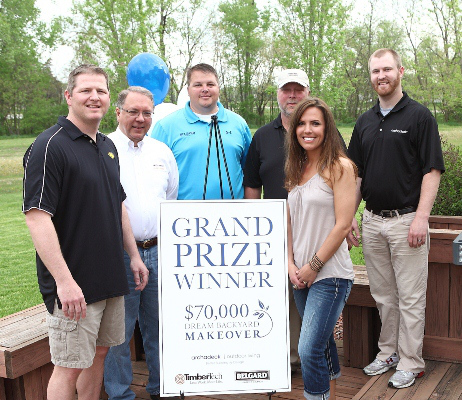 First prize – a $70,000 backyard makeover sponsored by TimberTech Decking and Belgard Hardscapes. The winner of this will have an absolutely gorgeous new outdoor living area with both a deck and hardscape component design and built by Archadeck Outdoor Living. 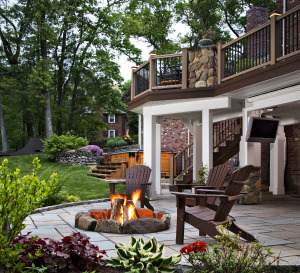 Second prize – a $7,000 deck or patio renovation by Archadeck Outdoor Living. Third Prize – a $3,000 outdoor lighting system from Outdoor Lighting Perspectives. The full descriptions of the finalists’ photos will be posted on the Archadeck Facebook page when voting opens, but here’s a glimpse at the March finalists! The first March finalist comes to us from Connecticut. The first time homeowners and parents fell in love with this home despite the old, not up to code deck and porch. The backyard has great potential to be the perfect space for this growing family. This house is not only the first home the couple has owned, but the first backyard both of them have ever had after growing up in the city! We at Archadeck Outdoor Living see the possibilities! The second finalist comes out of Iowa. This family had to move to a larger home after adopting two kids from foster care. Now with four young kids (under the age of 10), the homeowners would like an outdoor space for the kids to play away from the television and computer. The parents hope to have a space to relax (maybe cook) and watch their kids enjoy the outdoors. With a large yard like this, the options for a Dream Backyard Makeover are endless! Congrats to our March finalists! For everyone else, keep the entries coming. The last group of finalists will be announced on April 22nd! There is still time to enter! 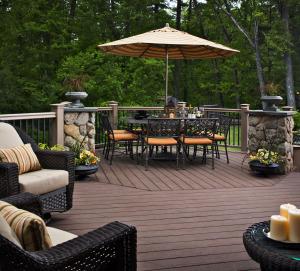 We at Archadeck Outdoor Living pride ourselves on being the experts in outdoor living structures. Whether it is a deck, porch, patio, pergola or other project, we design and build the backyards of our clients’ dreams. I hate to admit it, but despite being America’s oldest and largest deck builder, our corporate office’s outdoor living space is lacking. Actually, it doesn’t really exist right now, but we are thrilled to say that that will be changing soon! Since we are currently in the middle of a $70,000 dream backyard makeover contest, we decided it was time to build our dream space too! 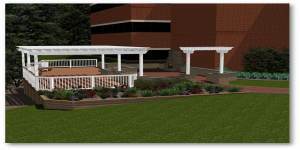 Our corporate design staff of draftsmen have designed the perfect outdoor living space for our corporate offices that will soon be underway. I, of course, will be sharing photos and details of how it is coming throughout the process. To start, I want to show you what the plans look like. As you can see in the first 3D rendering and the photo, our corporate office’s property doesn’t look like a place the outdoor living experts work. We, along with the other companies that we share our building with, wanted a place to enjoy the outdoors when the weather permits. Since we would be the ones designing and building the space, we created a combination structure to show our corporate partners, franchisees and potential franchisees. The first step in the process is to get permission from the building owners to make the significant enhancements to the property. Much like our system of porch, patio and deck builders do with their clients, our corporate team presented them with several options to consider. An outdoor living project is a significant investment and it’s important to us that our clients feel confident in their purchase when they sign a contract. To ensure that is the case, our design options are presented in 3D renderings that depict what the space will look like on their property. These renders have our entire office waiting impatiently for the space to be available. 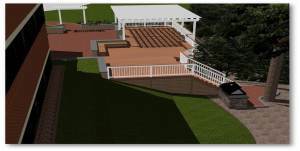 For the detail-oriented, here are the specifications of the space: The deck will be a little over 900 square feet. In addition, it will have 105 linear feet of white, vinyl railings, 38 linear feet of composite bench, composite trim and solid board skirting. 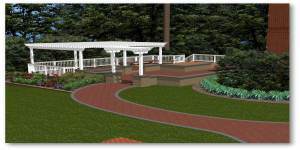 There will be a total of two pergolas, an entrance one, comprised of 34 square feet and the second one that covers part of the deck will be 484 square feet. As for the paver component, the space will have a total of 1,020 total square feet of Belgard Holland Stone, 108 linear feet of seating wall and 4 stone columns. On the upper patio there will be a 9 foot wide fireplace and an outdoor kitchen on the lower patio. We are all excited to build and enjoy the new outdoor living space. We are currently waiting for all of the local permits to go through before we break ground on the space. Sit tight for updates! With the first month down, we at Archadeck Outdoor Living are happy to announce the first two finalists for Archadeck’s Dream Backyard Makeover. We had just under 350 entries in the month of February, making it extremely tough to pick just two deserving families. If you haven’t entered the contest yet, make sure you do at DreamBackyardMakeover.com. Two finalists are chosen for the months of February, March and April. On April 23rd the photo descriptions and photos will be posted for online voting. The winner of the $70,000 makeover will be chosen as a result of panelist votes and Facebook votes. TimberTech Decking and Belgard hardscapes will be used in the final project. Here are the two finalists for February (full owner descriptions will be posted when voting begins on April 23rd). The first is out of South Carolina where the homeowners were unfortunately taken advantage of by a lousy contractor. They hired and paid a contractor to build a new deck off the back of their house only to have the contractor disappear in the middle of the project. To make matters worse, the homeowners found out that none of the work was done to code leaving an unsafe structure! The second finalist comes from the Chicago area. The homeowners purchased this house only 3 days after welcoming their first child. They hope to raise their family in this house, but it needs some work. They plan to host friends, family and neighbors in the backyard of their dreams if chosen for the backyard makeover. Congrats to our two finalists! One of the reasons my husband and I bought our house was the potential we saw in the outdoor living spaces. It has space for a large deck and good sized patio. While we have major plans that we would love to tackle all at once, we know it will need to be done over a few years as time and money allows. Unfortunately for me, I am unable to enter the Archadeck Dream Backyard Makeover contest that just launched. Oh wait, I forgot, a $70,000 Dream Backyard Makeover! The lucky winner will get an unbelievable project designed and built by Archadeck Outdoor Living with materials from our awesome sponsors, TimberTech decking and Belgard hardscapes. Ok, so here are the details. Starting today, homeowners can enter to win the backyard of their dreams on our Archadeck Facebook page through April 21st. A photo of your current outdoor space will ensure that we design a space that will complement your current home. Additionally, our judges want to hear from you! Tell us how you would like to use the space and what you envision. Two finalists will be chosen for the months of February, March and April. On April 23rd, fans are invited to vote for their favorite finalist and the final winner will be announced by May15th! We couldn’t give away just one prize though (what can we say, we like to give). The second place winner will receive a $7,000 deck or patio renovation and the third place winner will get an outdoor lighting system! What are you waiting for? Go enter to win! I’ll be updating everyone on all the different steps as it happens. Good luck! I periodically visit the college I graduated from (go Spiders!) to see how the campus has grown and changed. Since I was there as a student, numerous changes have occurred including a new International studies building. It’s beautiful, but one of things I found most interesting was actually outside the building. Behind the building there was an outdoor classroom. It has a few rows of retaining walls made for seating and an outdoor chalk board for teachers to write notes. Outdoor Classrooms, according to Newsday, are gaining in popularity as they provide an opportunity for students to spend more time outdoors instead of constantly inside. Some schools are using their outdoor classrooms as a place to learn about nature and science. For younger students, this could be a great place for some of the messier experiments that usually are done inside. The designs of outdoor classrooms vary widely. While some, like the one at my alma mater, have rows and a chalkboard, others are a little more unconventional. 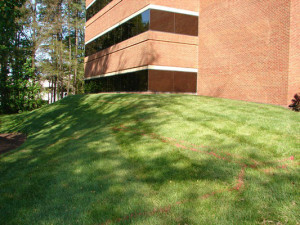 At Mount Olive College in North Carolina, their outdoor classroom is circular and from above creates a Celtic cross. It was created for outdoor lectures and can hold up to 30 people. To me, this is an exciting development. I can’t remember how many times throughout school I wished we could go outside for a class. 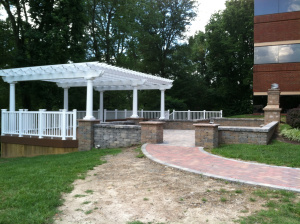 At Archadeck Outdoor Living, our hardscapes or covered porches would make for great outdoor classrooms. An important design feature is to make sure that anything new on a particular property doesn’t look like an afterthought, but as an extension of the space. If a school, for example, consists of all brick buildings, the finishes on the outdoor classroom should be brick as well. Another point to consider is how the space will used as some components may not be portable. Should it have rows? Are tables better? Will a chalk board of some kind be necessary for students and teachers to write notes to follow along? These are all things that your outdoor living designers and contractor should be asking you so you get an outdoor classroom that not only looks great, but will be used. If you have questions about if an outdoor classroom is right for your school, please contact your local Archadeck Outdoor Living office. In previous posts we have talked about planning your entire backyard space at once and building it in phases as schedules and budgets allow. A recent project from our deck builder in Chicago did just that. David Berryhill owns Archadeck of Chicagoland and last year was contacted by a customer who wanted to upgrade their outdoor living area. 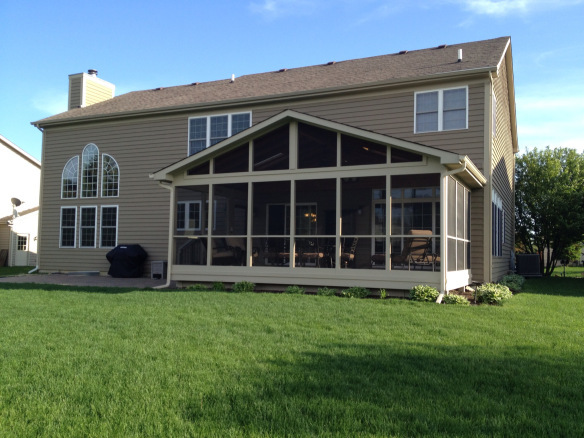 The homeowners originally called David to take down their existing deck and build a new screened porch in its place. While there, they talked about possibly adding a patio in a year or two when they were ready. 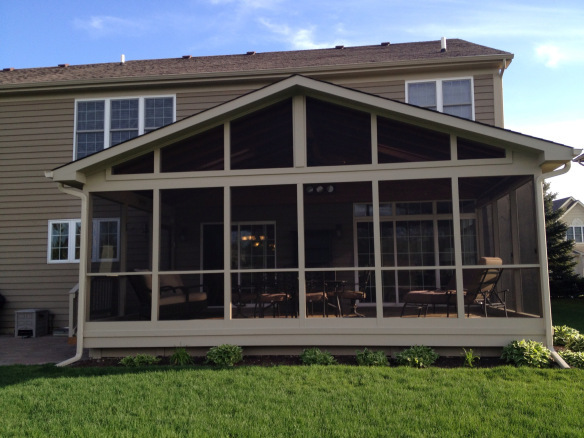 Knowing the future plan, Archadeck of Chicagoland built the screened porch in 2011. They constructed it out of pressure treated pine that was finished to complement the home’s siding and trim. 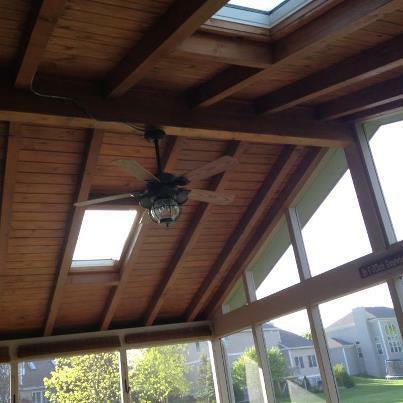 Inside the screened porch, two skylights were installed to let more sunlight in as well as a ceiling fan for those hot days. The ceiling itself has wood finish with exposed beams for a more rustic look. After enjoying their screened porch for a year, the homeowners were ready to add the patio they had initially talked to David about. The low to grade patio was constructed using Belgard Mega Arbel product that has a stone appearance with slight variations in color. For added visual interest, Archadeck Outdoor Living finished the spaces with curved edges instead of the normal straight lines. When thinking about building a memorable hardscape such as a patio, outdoor fire pit or outdoor fireplace or even an outdoor kitchen, it is the details and subtle nuances present in the design that make it a cut above the rest. Seeking areas to add design oriented touches and beauty can not only make your hardscape a pleasure to look at, but sometimes adding these touches can also add to the functionality of your structure as well. We like to call these nuances and design details, creative hardscaping. Thinking outside the box when it comes to creating a backyard hardscape takes experience, and design expertise. One example of creative hardscaping is creating a seating or relaxation area with little more than an idea and additional hardscape material. For example, you can create a seating area to complement an outdoor fireplace or fire pit by incorporating a roomy hardscape ledge or hardscape bench seating. With this added seating area, there is no longer a need to bring in outdoor furniture for a place to sit while the fire pit is in use. Using hardscape materials in an innovative manner is not exclusive to fire pit designs. There are endless possibilities of ways to use hardscapes to enrich and expand your outdoor living enjoyment through design. A simple patio can become a place of enchantment for a child by extending the patio area to include an area that shines new light onto the typical playful sandbox of yesteryear. An outdoor kitchen and grilling area becomes an outdoor bar perfect for entertaining with just a little imagination. If you are planning an outdoor structure with hardscapes in your near future, contact Archadeck to plan, design and build a hardscape that uses the art of creative hardscaping in each and every design. Not only will you be the envy of the neighborhood, but the functionality it will add to your backyard enjoyment will astound you as well. To find an Archadeck location close to home visit our locations list, located on our website. See more stunning hardscape designs by visiting our patio and hardscapes gallery also located on our website. When you think of the reasoning behind building an outdoor structure such as a patio cover in your backyard you have to really focus on the term “outdoor”. Homeowners make the decision to ultimately add such a structure because of a deep love for the outdoors. It can be the way the wind feels in your hair. It can be the smell of the brisk fresh air after a summer rain. It can be the way you love to gaze upon the clear night sky. Or maybe you love the way the sun feels on your face. Whatever the personal reason, it all comes down to mother nature and all she has to offer us. Among the many reasons homeowners choose to build an outdoor structure maybe the number one reason that comes to mind is the love of flowers, and gardening. One way to incorporate flowers and the joy of gardening into your lifestyle and bring it closer to your home is by way of the patio garden, and no patio garden would be quite as enchanting without a patio to enhance the beauty and folly associated with cultivating and nurturing your own patio garden. Covered patios, or patio covers are the perfect way to bring the beauty of the patio garden to life and share the beauty of your bountiful blooms within closer proximity than having to venture into your backyard. Patio covers can also add valuable outdoor living space to your backyard. They can be incorporated into a design that includes a deck, where the deck would spill into the patio cover adding an abundance of added functional space. Patio covers can also be designed to include other luxurious outdoor amenities such as outdoor fireplaces and outdoor kitchens. There is no limit to what can be included into your patio cover design, the choices are as endless as your own imagination. In terms of working in correlation with a patio garden, your structure can be designed with custom planting areas, so you can watch season to season as the colors and textures of your plantings change. The same artful design elements that go into creating a patio garden, are also used to create the perfect covered patio as well. Patio covers are usually constructed of hardscaping materials. Whether you choose a synthetic or natural stone, concrete, or even pavers; elements like color, shape, size and location all play a major role in a well designed patio cover. The same can be said about the elements you choose to fill your patio garden with as well. 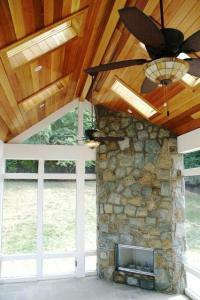 Archadeck uses high quality materials and expert workmanship as the basis for all their patio cover installations. One of our most popular hardscape materials to use when constructing an outdoor structure such as this are Belgard pavers, as well as various natural stone variations and flagstones. These materials, among the many other choices we offer, have a huge style and color selection available for homeowners to choose the perfect size, shape and color as the foundation of their patio covers design. Of course when you take the facade of the patio cover into consideration you can’t leave behind the beauty and functionality of the interior. We can create a covered patio that will not only complement your gardening skills, we can also turn the patio cover into a place of endearing relaxation by adding ceiling fans for those warm days and even if you so desire, outdoor water features, outdoor fireplaces, and an outdoor kitchen as well. We can finish out the interior ceiling of your patio cover to make it as beautiful from the inside, as it is from the outside, by the use of design elements such as bead-board ceilings, and even open rafter systems to bring out the rustic side of you. Whatever you fancy, we can incorporate your desires into the design of your patio cover. If you are ready to “tiptoe through the tulips” by creating a serene environment to enjoy the benefits of a patio garden and any other luxuries mother natures bounty has to offer, contact Archadeck to create a patio cover design that is tailor-made for your love of the outdoors. To find an Archadeck location close to home visit our locations list which is available by visiting our website. You can also see more photos of patio covers by visiting our patio and hardscapes gallery also located on our website. Outdoor Fireplace or Outdoor Fire Pit? Some Considerations. Fall is in the air, maybe you have noticed it in the wisp of the wind that seem a little crisper than usual, or the way night is upon us sooner with each passing day. There is no denying that the masterpiece that mother nature paints for us each autumn is just around the corner. With cooler temperatures come less insects, less humidity and more time to enjoy the outdoors. Certain outdoor structures just seem to be tailor-made for the fall. Custom outdoor fireplaces and fire pits are among the best candidates for fall focal points within the landscape. Imagine the crackling fire, roasted marshmallows, hot cocoa and conversation. Even though both of these structures offer the warmth and glow of one of natures most intoxicating elements, they differ in many aspects. Deciding which kind of structure is right for you all depends on what you most want to get out of the structure in terms of functionality. Even though it might seem simple, there is a lot more to it. Most folks think in terms of their budget, they assume that if they have more to invest they will go with the custom outdoor fireplace as opposed to having less, in which case they assume that a fire pit is the lesser investment. Both structures have their advantages, and both structures can be constructed as elaborate or as simple as you wish. An outdoor fireplace makes a statement within the landscape, or when used in conjunction with another outdoor structure such as on a" patio":https://www.archadeck.com/design-ideas/patios-hardscapes/ or even a covered porch. The fireplace offers a more intimate setting to its users with a typical 90 degree radius of room for entertaining, or to gather around the structure. 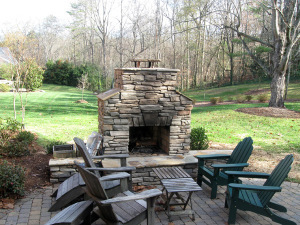 Outdoor fireplaces require the use of many elements such as design, position, stonework, masonry, gas and plumbing. An experienced licensed builder can assist you in making many of the decisions, but there are many options available with today’s fireplace that can make a simple fireplace an amazing fireplace. From customized mantel pieces, to compartments custom-built within the fireplace to store wood and accessories. Fireplaces can be built in all shapes and sizes and in a variety of beautiful hardscape mediums such as brick, natural stone, and man-made hardscaping materials such as those offered through Belgard. The source of the fire itself can be obtained through gas or propane with a ceramic log that looks like real wood without the messy cleanup , or in some cases a wood burning fireplace may be your best option. Your fireplace design is only limited to your imagination, whether you choose a modern streamlined fireplace with no hearth, or a rustic beauty of natural stone, an outdoor fireplace can really heat up the conversation and the intimacy when entertaining, as a focal point of beauty and relaxation. Custom fire pits have become a work of art within the world of outdoor structures in their own rite as well. A fire pit can offer you that same ethereal glow and ambiance , and can lend itself to dazzle a larger crowd. Fire pits offer a typical radius area of 180 degrees for entertaining and enjoyment. The addition of a ledge can add seating and a vantage point to enjoy the glow of the fire without having to purchase additional furniture. Fire pits can also be constructed with a large selection of materials, much like the fireplace but can also serve double and even triple jobs that can change from season to season. A fire pit can be easily equipped with a drain which makes it possible to be used as a planter during the summer. It can even serve as a tranquil water feature as long as there is an exterior outlet nearby. 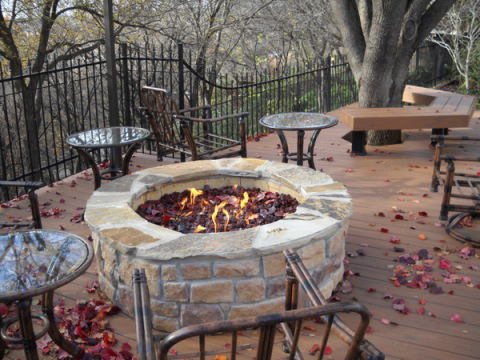 Archadeck of Austin wrote a story about a homeowner who created an “all season” structure with her fire pit, you can read the story by visiting" https://austindeckandpatiobuilder.com/2011/03/14/a-flame-of-many-colors-a-fire-pit-with-multiple-personalities-integrated-into-the-design/":https://ww1.austindeckandpatiobuilder.com/ Custom fire pits can also be equipped with a dazzling array of glowing glass fire rocks that come in a wide variety of colors. Fire pits that are powered by gas can even have a gas star installed where the flame is emitted in a unique star pattern. Archadeck lays the foundation to your fantasy with the perfect patio. There is nothing quite like summer. We all wish for an endless summer of sunshine, a landscape of forever green, flowers that never stop blooming and cherished time spent with family and friends among the great outdoors. With a beautiful custom-built patio by Archadeck you can make this wonderful time of the year even more special. Whatever your mood, walking onto a stylish patio by Archadeck can turn even the cloudiest day into sunshine. The origins of the patio come from deep within the history of Spain. The actual word itself was borrowed from Spain and means “an inner courtyard or paved area that is adjacent to the home”. With today’s homeowners discriminating tastes, we offer patios custom-built in a manner to express your individuality . 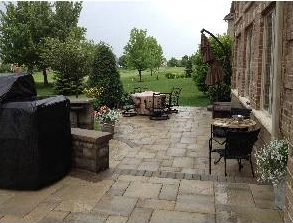 From scored and stamped concrete, natural stone and hardscapes such as Belgard pavers. From modern to rustic we can build a patio to suit your needs and complement your homes integrity, creating the kind of backyard you dream about. Of course, today’s patios wouldn’t be complete without the proper accoutrements to define and complement your space. The perfect patio furniture and accessories create the perfect way to turn up the style on your patio by Archadeck. Patio furniture such as those seen in catalogs like Frontgate offer European inspired outdoor furnishings, and those in Grandin Road offer a more casual, contemporary feel. From Teak, to wrought iron to the elegance of wicker, the choices are endless. If modern, clean, crisp lines are your style imagine a stain and stamp patio finished with a stunning suite of contemporary metal furnishings with a sleek design. The pairing of carefully chosen outdoor furnishings on your patio can pull everything together like a harmonious work of art. Maybe a laid back rustic country chic attitude is more your choice. The vision proceeds with rustic old world hardscape detailing underfoot along with washed wooden furniture with overstuffed cushions to wisp you away to comfort. Whatever your taste, whatever your fancy Archadeck can lay the foundations to your fantasy with a custom-built patio or outdoor structure. Patios, whether covered or uncovered create the perfect place for entertaining, cooking, relaxing and spending quality time with the ones you hold close to your heart. Not only do they provide function, their form provides the perfect complement to your home and landscape. 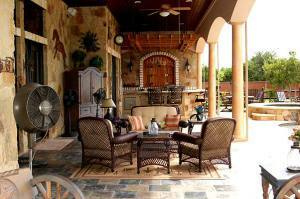 A patio is a wise investment in terms of adding value to your home. Constructed of durable and long-lasting materials that withstand the elements better than wood, a patio is a solid choice in terms of materials and as an investment. Belgard introduces Archadeck as a new addition to their authorized dealer network with rave reviews. Belgard recently introduced Archadeck as a new addition to their authorized dealer network and we couldn’t be more ecstatic. 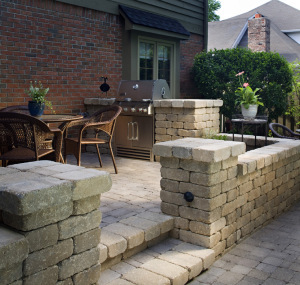 Belgard is one of the industry’s top manufacturers of hardscapes such as pavers and retaining walls. 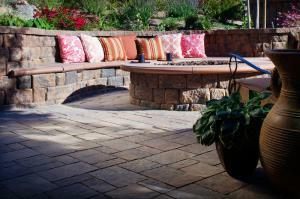 Archadeck is proud to be authorized dealers of Belgard in our locations throughout the country. 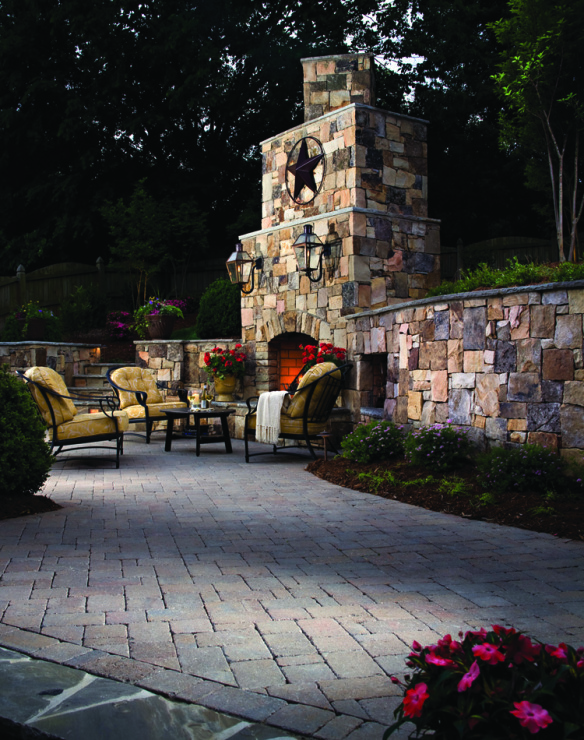 Our partnership with Belgard reinforces our goal of using the finest materials to create America’s best outdoor spaces. Belgard uses a multi-step design guidance presentation that incorporates design, color, shape and texture. Their motto is “be prepared for company”, and by using this design guide in preparation for having Archadeck build your outdoor structure, you can rest assured the structure you get will be the envy of the neighborhood. The design guide helps homeowners with four basic steps. The first step is to decide what your outdoor structure will be used for. Will it primarily be used to entertain? Or will it just be used as a sanctuary for relaxing with the family? Considerations in your personal tastes and how you want your outdoor structure to impact your life will play a key role in what type of hardscapes will work best in your design. The second step is to consider your owns home’s architecture. The goal with any good outdoor structure is to work in harmony with your existing structures and complement their differences and what they have in common. " You want to work with the grain instead of against the grain" in terms of how your outdoor hardscape structure will affect what you already have. The next step when creating a memorable hardscape design is to extend the visual line from the corners, doors and windows in order to incorporate your landscape design into the big scheme of things by creating shapes to play up the landscape in your own backyard. The goal here is to see the package in its entirety and not draw the eye to one specific area, a good hardscape design harmonizes with your home, and your yard. Finally, size matters. When you imagine your perfect outdoor hardscape structure in your mind once it is finished and every little detail is in place, do you see your outdoor furnishings? Are your chairs neatly tucked in? When considering what size structure is best for you always remember that you need ample space to move around when the furniture is in use. Take leg room into consideration, and pull out room for the chairs as well. This is a simple step, but a crucial one in how much enjoyment you get from your structure in terms of “real life” use. Those pretty pictures in magazines are depicting the area not in use. Thinking outside the box will help you achieve optimal pleasure when using your structure. A paver patio by Archadeck is built tough from the ground up. Paver patios can be simply extraordinary in terms of design and the rustic elegance they encompass. Paver patios are full of personality and the selection of patterns, textures and hues they come in can be customized to reflect a homeowners personal taste and style. Taking all this into consideration, pavers are even more amazing because of their strength. A professionally installed paver patio can withstand several thousand pounds of pressure. I am sure your average dinner party or family get-together outside on the patio would never put this to the test, but the fact of the matter is the cohesive combined strength which is evident in a paver patio is not only strong but it is versatile. A paver patio can be extended in the future if you so wish, and replacing an individual paver is easy. Many people don’t realize what elements go into constructing a paver patio, but I am here to tell you, they are built tough from the ground up. Archadeck begins by digging out the area where the patio will be installed. They do this by digging down about 9 inches. Then “roadbase” is brought in, which is basically a rock filler. It is then compacted down with a machine that will bring it to 6 inches of thickness. Once the roadbase is well compacted, sand is put down. The pavers are then placed atop the sand and compacted down using the compaction machinery again, this will cause the sand to come up through the joints of the pavers. Following this step a layer of Polymeric sand is put atop that, which is again compacted and the sand is brushed in. The top layer of sand has an added polymer which when water is applied, acts as a binder, which binds the sand so there is no loose sand. To ensure nothing washes away beneath these layers Archadeck installs a geo-grid to hold everything in place. In the case of a paver patio if there are any upward pressure points or issues this generally happens early on, within the first year following installation. If this happens it is an easy fix, by breaking out any area that is presenting a problem and fixing it. The key to a paver patio is the base, making sure it is leveled and properly compacted. Paver patios also pack another punch, they are less likely to fade than a stain-and-score concrete patio and will not show signs of wear. Concrete patios such as a stain and score are also more likely to crack, whereas part of a paver patios charm are the cracks themselves (joints) and any give will affect the joint and the paver itself will not crack. Pavers can be used in more designs than just patios. Today’s paver is not a one trick pony, it is used to build retaining walls, benches, fire pits, fireplaces# and so much more. Archadeck uses Belgard pavers. Their quality, style, textures and color choices are unsurpassed in the industry. Most of the pavers sold in your “big box” home improvement stores lack the quality to withstand the test of time, and offer very little selection. Imagine your outdoor oasis…a stone fireplace with surround patio floor of contrasting pavers set against the backdrop of nature and the sky. Have you taken a deep breath yet? Or maybe a pool patio hardscape with a covered patio flowing out into the horizon. The dream is yours- Archadeck can make it a reality. Transforming your outdoor place into an unforgettable space is a lot easier than you think. Archadeck has many hardscapes to satisfy even the most discriminating customer. We now offer the Belgard products in addition to our other hardscapes. Belgard is unsurpassed in quality and style. We custom design each job with your input and we have hardscaping to fit any budget. If you are considering a change from the deck or patio you have now, or if you are starting from a blank canvas, Archadeck can turn your backyard into a work of art. 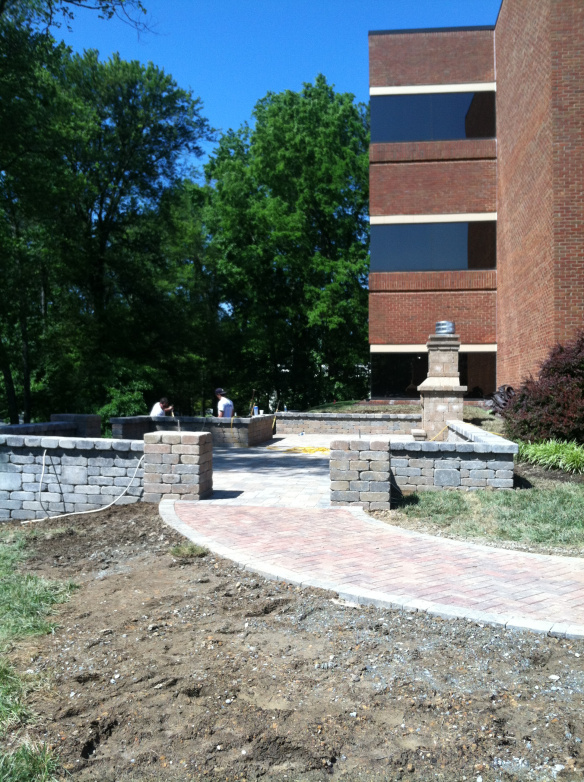 Multi-level hardscapes have become a staple in outdoor structures and beautification. The true meaning of a hardscape is the man made part of the grounds surrounding a building, as paved areas and structures, but it is so much more than that. The beauty and variety of today’s hardscapes take on a personality of their own. Hardscapes can be used to create barriers, driveways, sidewalks, walls, floors, water features, railings, fire features such as fire pits and fireplaces, planters and many more structures. The choices in hardscaping materials are as large as all the things you can build with hardscapes. Hardscapes can be natural or man made, such as stone, pavers, concrete, brick and the list goes on and on.